Michael A. Santoro is the co-author of Wall Street Values: Business Ethics and the Global Financial Crisis (2013). He is a professor of management and global business at Rutgers Business School in New Jersey, where he has taught since 1996. 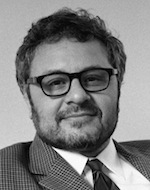 Professor Santoro's books include China 2020: How Western Business Can – and Should – Influence Social and Political Change in the Coming Decade (Cornell, 2009), Ethics and the Pharmaceutical Industry (2007) and Profits and Principles: Global Capitalism and Human Rights in China (Cornell 2000).